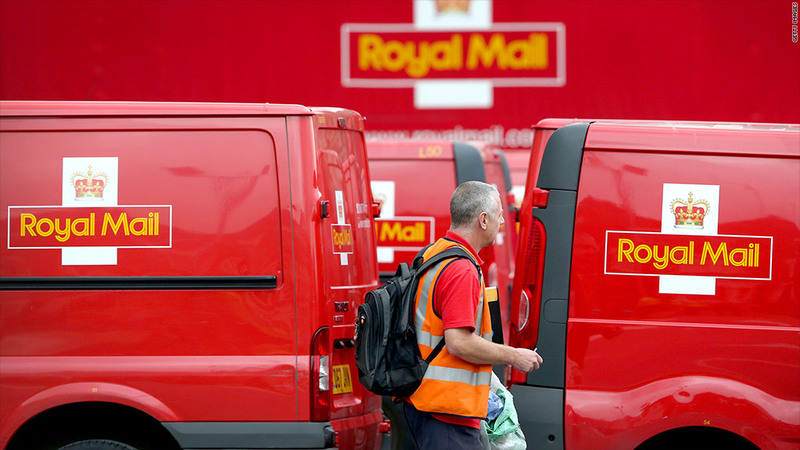 Royal Mail was the most anticipated IPO in London for 2013. Investors gave their stamp of approval to the Royal Mail on Friday, scrambling for shares in one of Britain's highest-profile privatizations in years. Shares in the iconic postal service operator soared by as much as 38% Friday after debuting on the London Stock Exchange. The government sold a 52% stake in the company, raising £1.72 billion ($2.8 billion). In addition, a 10% stake was handed to Royal Mail employees. The shares were priced at 330 pence each ($5.27) ahead of the opening bell, but immediately jumped to 456 pence each when trading began. The price eased back during the morning but was still up by over 30%. The government has sold off many state-owned companies in recent decades, including British Telecom, now BT (BT), British Airways and BP (BP). Large privatizations have become scarcer in recent years and the Royal Mail offering was heavily oversubscribed as the government encouraged individual investors to apply for shares. Those who scored the minimum allotment of £750 saw an immediate profit of about £250. But many institutional investors were left empty handed as applications for shares worth more than £10,000 were rejected by the government. That left some scrambling to buy shares from small investors on Friday. The Royal Mail had been seen by some -- including former Prime Minister and privatization enthusiast Margaret Thatcher -- as off limits for an IPO. Numerous efforts by previous U.K. governments to sell the postal service had failed due to heavy opposition. But the IPO remains controversial, with opposition politicians arguing that the postal service was sold off too cheaply. "The government has slightly mispriced this and they're going to be criticized for that," said Joe Rundle, head of trading at ETX Capital. "They should have priced it at £4 per share. If they had, we wouldn't have seen this mad scramble today." Royal Mail may soon be included in the FTSE 100 index of leading London shares. Of the current index constituents that floated in the past decade, broker Hargreaves Landsdown holds the record for the biggest gain on its first day of trading. Its shares jumped 31% on the firm's debut in 2007, according to S&P Capital IQ.